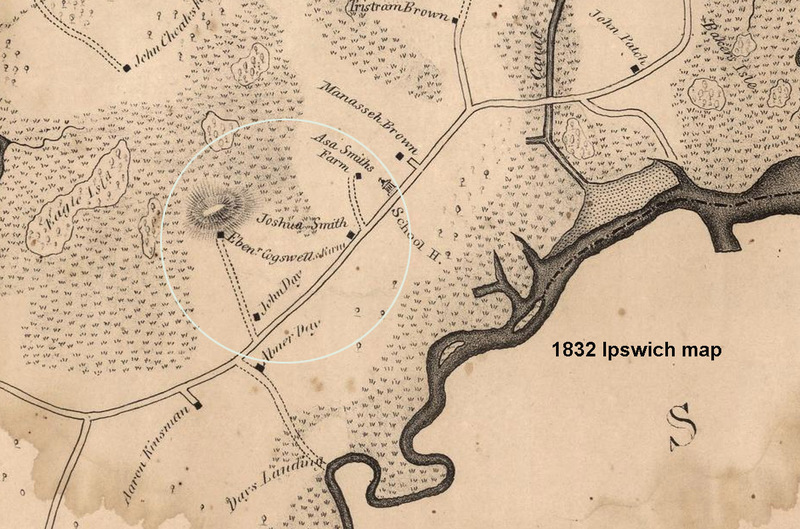 The house at 164 Argilla Road is on the farm granted to Daniel Denison, the early leader of the Ipswich. The house was built by Francis Cogswell or one of his descendants after he purchased the property in 1743, but the date of construction is uncertain. “Daniel Denison, the soldier of the Town, was fortunate enough to receive a grant of 150 acres on the slope and breezy summit of the hill, which very strangely never was honored with a name. He attained high honor as the General in command of the Colonial troops, and filled many important public offices in the Town and Colony. 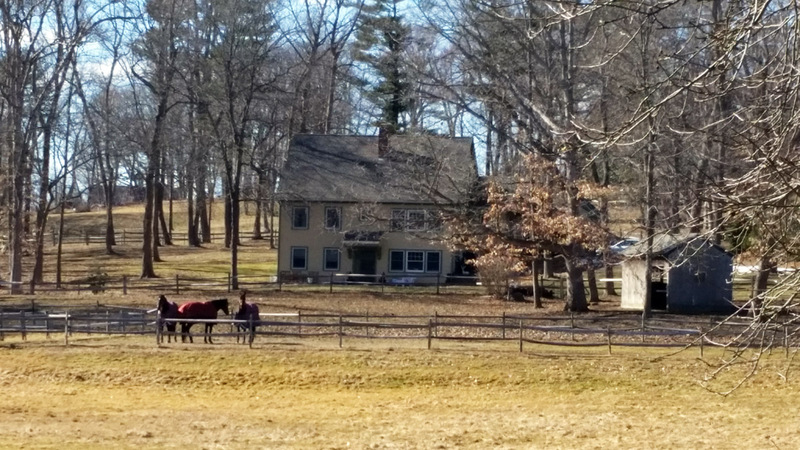 The highland farm remained in the Denison family for more than a century. Francis Cogswell bequeathed his wife Elizabeth the use and improvement of one-half his real estate, but gave all his real estate to his son Francis. The second Francis remembered his sons Francis and Joseph with his real estate. The third Francis left a wife Anstice and two sons Francis and Joseph, to whom his estate was divided in 1793. Joseph died in 1791, and his half of the estate continued to his heirs, Ebenezer and Joseph. The farm passed from generation to generation of the Cogswell line and was sold to Herman H. Story, April 11, 1884. He conveyed it to Dr. Herman F. Vickery on March 3, 1902, who occupies the Cogswell homestead on the slope of the hill, now Island Hill, as his summer home. He sold a portion on Sept 30, 1903 to Dr. Francis B. Harrington, who erected his fine residence on the very summit commanding a broad and beautiful landscape.” A great number of Native American skeletons and relics were discovered during the excavation. 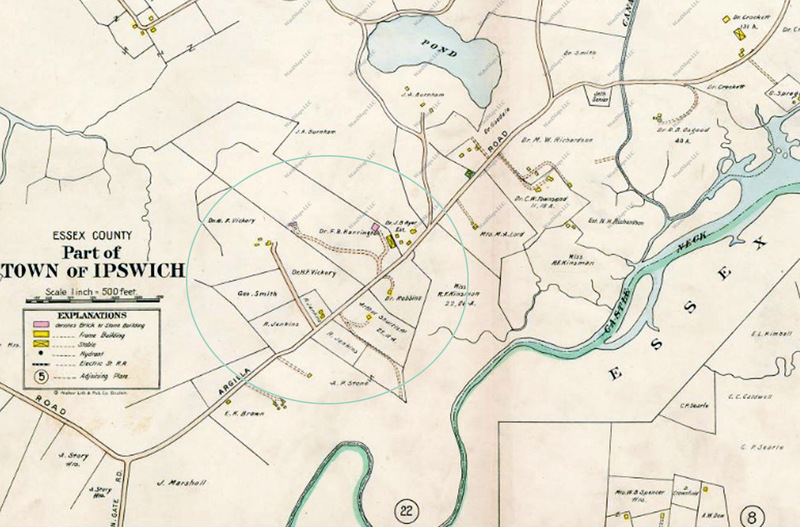 1832 Ipswich map of Argilla Rd. 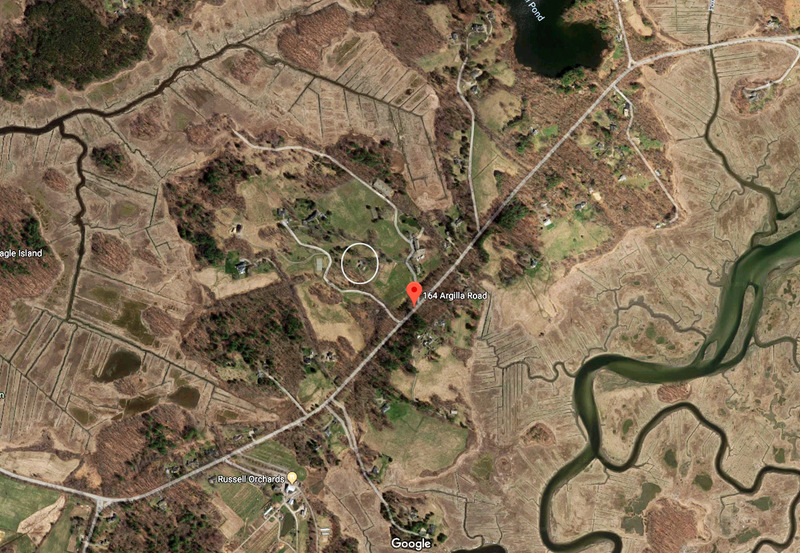 US Geological survey shows the 103′ hillside on which the Denison farm was located. The house at 164 Argilla is in the middle of the map.